Moments after I wrote this, I pushed on a particularly soft piece of metal on the FP, and broke it. DOH! Another thing to fix now…. June 15, 2012 in escapement, fix, problem, purple, purple smartie., royal arrow, Royal FP, Royal HH, typecast, typewriter. A big week for the typosphere, and no one knew anything about it! ← Dunking and drying. Did it work? Unless it is happening regularly, it's probably a typist error. My Royals are very particular about me using a good technique — which I lack — and I inevitably bunch up my letters or get odd spacing in the middle of a document. For me, the solution is to slow down a bit and try to type with a rhythm, and not the hurried slop that I use on the computer. Well that's the thing. It is happening only semi-consistently on the 'A' key, on the FP – which you can probably make out here. Occasionally on the 'B' key on the Arrow, and the HH – I haven't used enough yet. I guess you could be right. The way typing might contributing to this. I did notice on one of the jumped 'A' keys, it appears to have stuttered – leaving a slight imprint of the 'a' in the skipped line. That's an interesting way of looking at it. And perhaps I need to try and get someone else to bash at the keyboard/s for a bit and see what kind of result they get. I'm otherwise quite a proficient touch typist on most other keyboards.. It is just consistently the Royal units that I have this problem with. More accurately, it has only ever been the royal typewriters that I have had this problem with. You could be right – it could be a PEBKAC. But I think it might be augmented by a way that Royal implement their escapements, or possibly how their keyboards are structured. design styles might not be the problem, but rather add to use error. But yes, I should have had someone else type on it for a bit. I have to be very careful how I type on my Royal “O” portable; if I strike the keys too quickly one after the other, I inevitably get letters bunched together. Once in a while, outright skipping. If I type slowly and deliberately, most of these quirks disappear or are greatly reduced in frequency. My Royal Model 10 seems a bit more forgiving; no skipping or bunching together. Its only issue is the back panel with teeth on the bottom; a couple of teeth are worn and the carriage skips in the same exact spot, towards the left-hand margin. If anyone has a spare intact back toothed panel from a parts Royal 10, please contact me! I have not experienced the problem on my Royals, but I have on Skyriters. Rhythm seems to be everything. Then a dirty or worn escapement gear will produce the same problem, but it is usually consistent. My worst one is my Remington Noiseless Model 7. I can see that being a problem with the portables. My Arrow seems to bunch up if I'm really building up a bit of speed. I increased the touch to try and compensate, but it really didn't do much. I think I'm just heavy handed. I have heard from several people that the Noiseless units really do need to be kept clean, otherwise you may end up in real trouble. Tighter tolerances on a lot of moving parts? Could be. I have less of these issues on newer machines, so there's always the possibility that lesser quality metals break down and corrode over time. Potentially leaving debris in moving components. I have this problem with pretty much all of my Smith Coronas. For me it was all about learning how to type with consistent pressure. I've gotten so good at this on my Smith Coronas I don't even notice it on my Royals. Get a Classic 10 or Classic 12 if you want to learn how to type with a worn escapement. Royals do tend to have this problem, but every one I've had is fixed immediately by simply cleaning the accumulated gunk out of the works. No mechanical repairs were needed. My HH builds up gunk fairly quickly, but a quick squirt cleaner into the basket resolves it immediately. Funny…I have the exact same problem on my Underwood Champion portable. It is my every day typer, but from time to time the A key will skip, and also leave a slight imprint. I am not sure if it is the way I am typing, but it is consistently the A key. Yeah, I'm starting to get the impression from my posting here that – at least on my Royals – i'm typing t0o quickly or too lightly to do the job. The A is the most consistent on the FP, and it has quite a heavy keyboard. Where as the B on the arrow probably gets jabbed quite heavily, which may be causing bounce too. I might try adjusting styles and see what I can achieve. Well, I'd like to think I had extensively cleaned the FP. But I get the feeling I have not paid as close attention as possible. The HH is really in bad condition, but the Arrow was extracted out of floodwaters, so I suspect that there is still a lot of that thin layer of silt all the way through it. My '47 QDel has been know to skip as well. Most annoying, since it's the quietest machine I have and a joy to type on. I may give the basket a quick squirt of WD-40 or sewing machine oil and see if that improves things. 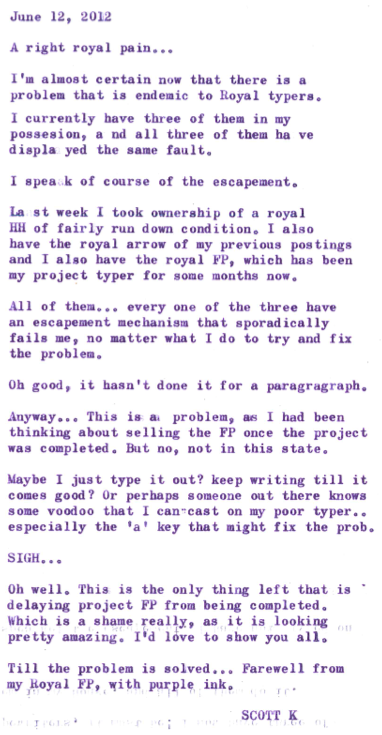 Tom Furrier from Cambridge Typewriter did tell me that Royals are prone to this problem. Never had this problems with Royals, but my Noiseless 77 is a chronic skipper, mostly around the 's' key. Hi, there. I come across this blog entry late, so I hope it's still active enough that you can read my reply. The problem you are having is caused by improper typewriting technique. Some typewriters—notably, pre-War typewriters–are built sturdily enough to overcome the skipping, but many post-War typewriters are simply too sensitive to take it. The reason the “a” is skipping is because you are hitting the key wrong. Manual typewriters are meant to be strummed, that is, struck with a direct downward motion of the fingers, as if you were strumming a drum. If, by contrast, the typist strikes the key at an angle, the key will hover too long near the platen, causing the carriage to skip. In your case, I would bet that your pinky finger is significantly shorter than the rest of your fingers, which causes it to overcompensate by striking the key too hard. You can help to overcome this tendency by making a conscious effort to strike the keys on the tips of your fingers while your fingers are curled, rather than striking the key at an angle, on the soft tissue of the tip. “How do you know this to be true?” you might ask. I know this because I have spent quite a bit of time studying old typewriter manuals. This is caused by improper typing technique. Most likely, your pinky finger is significantly shorter than the rest of your fingers. This causes the pinky to overcompensate by striking the key too hard, causing it to hover near the platen too long, causing the carriage to skip. You can overcome it with a little bit of practice by typing on the tips of your fingers, striking straight down, rather than striking the keys at an angle.